A native of Colorado, Keith was born and raised in Ft. Collins where he attended Colorado State University for 2 years in pursuit of a Physical Education major. At the same time that he was questioning whether or not to continue that pursuit he was offered a management position with “Round the Corner Restaurants” where he had worked since High School.This was the beginning of an 8 year career in business management during which Keith managed four different restaurants in Ft. Collins and Boulder, a dry cleaning business and finally as Assistant Manager for Marshall’s Department Stores in Boulder. It was during his time in the Department Store, as they were “grooming” him to take over his own store that Keith became increasingly interested in the idea of full-time church work. After being told that he was “too honest” to go much further in the retail business world, and much prayer and soul searching, Keith, with Mary Beth’s blessing decided to pursue the pastoral ministry in the Lutheran Church–Missouri Synod of which he has been a member all his life. This required two years at Concordia University in Seward, NE where Keith was able to complete his Bachelor of Arts degree and complete all of the recommended languages and pre-seminary class work. There he was honored by the faculty as the “Outstanding Graduate” in the Pre-seminary Pastoral Program. In the fall of 1992 Keith began his seminary training at Concordia Seminary in St. Louis, MO. During his time at the seminary, Keith was gifted with an “extra education” in construction and maintenance as he worked for the Seminary’s maintenance department around his school work and family responsibilities. 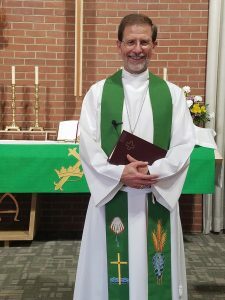 After four years of seminary work, including his vicarage year in Bloomfield, NE, Keith graduated from Concordia Seminary in the spring of 1996 with a Master of Divinity. He received his call to Christ the Rock Lutheran Church at that time and served the Lord and His flock there until January, 2003. He now serves as Pastor to Christ’s saints at Mt. Calvary Lutheran Church – Ft. Lupton, CO. 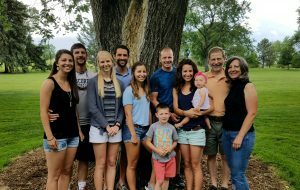 The Lord has blessed Keith with a wonderfully patient and loving wife, Mary Beth and four beautiful children — Brittnie, Travis, Kierstyn and McKayla. Around his duties as pastor, Keith enjoys most sports, woodworking projects and any activity that allows him to spend time with his family.